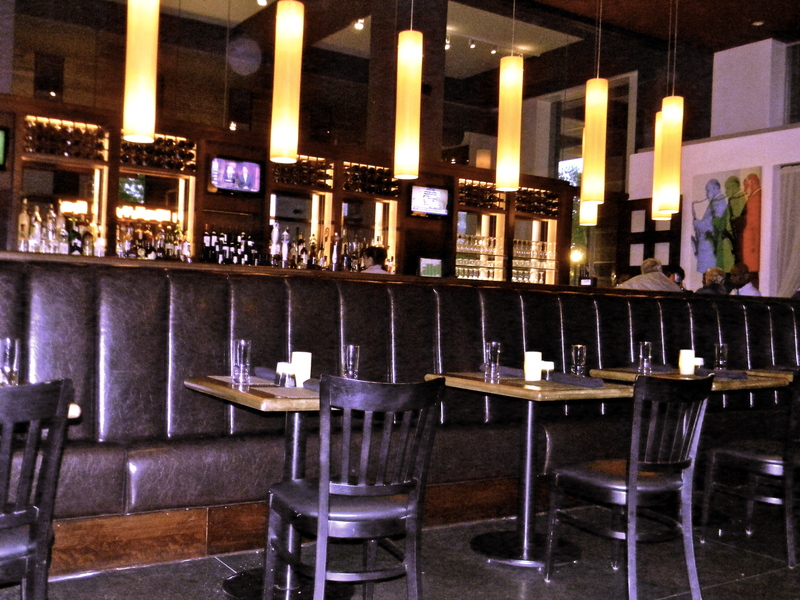 NICO Kitchen & Bar is an hidden Italian gem nestled in the New Jersey Performing Arts Center (NJPAC) in Newark, NJ. The restaurant is owned and operated by Culinaire and its acclaimed Executive Chef is Ryan DePersio. Once you enter NICO Kitchen & Bar, you instantly feel a shift in the atmosphere as the decor exudes a restaurant in Midtown Manhattan. Although the restaurant is spacious with many tables and a tall ceiling, you still get an intimate feel from the dim lights and warm colors that bounce off the walls. A friend and I were sat in a comfy, leather bonded booth with a spacious table just ready to be filled with delectable plates of food. The waitress explained the menu to us, as she was very knowledgeable about the menu and made several suggestions. 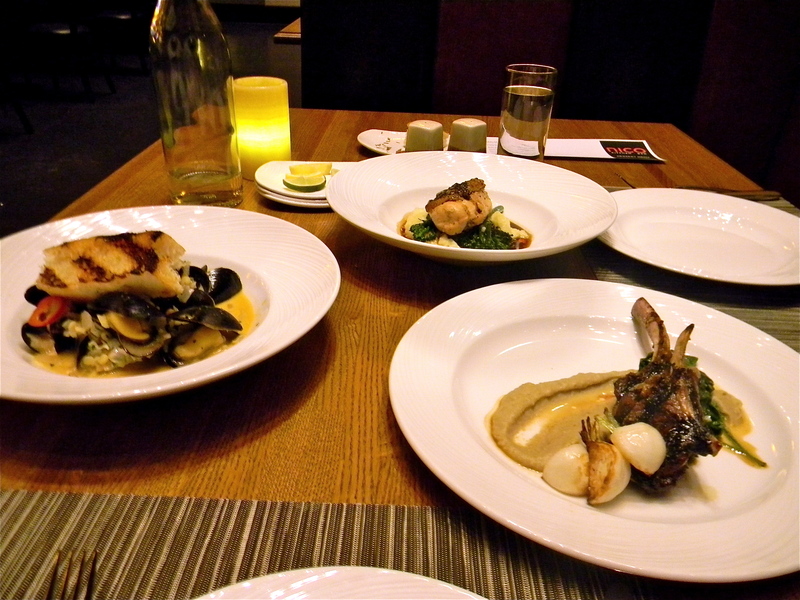 We ordered an array of several dishes coursed throughout our meal experience. 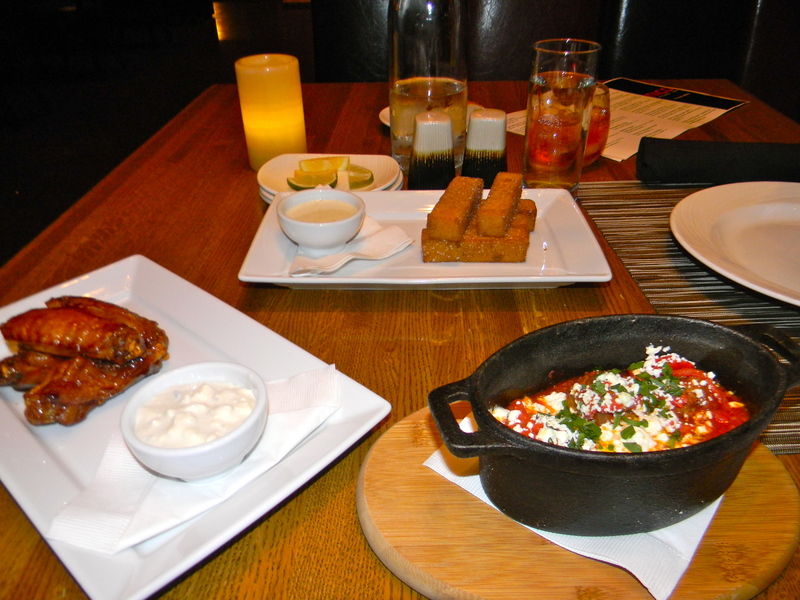 For the first course, we ordered Pomegranate Chili Wings, Lamb Meatballs, and Polenta Fries. The flavors of the wings with creamy gorgonzola fonduta served my palette well with the tartness of gorgonzola, light sweetness of pomegranate, and a hint of chili spice. The succulent lamb meatballs was served in a savory tomato sauce with roasted red peppers and crumbled feta cheese. Lastly, the toasted polenta fries was golden and crisp with a creamy interior. NICO Kitchen & Bar has a brick oven and as noted by the server that the pizza dough was a family recipe often tested and perfected so I had to try to it. 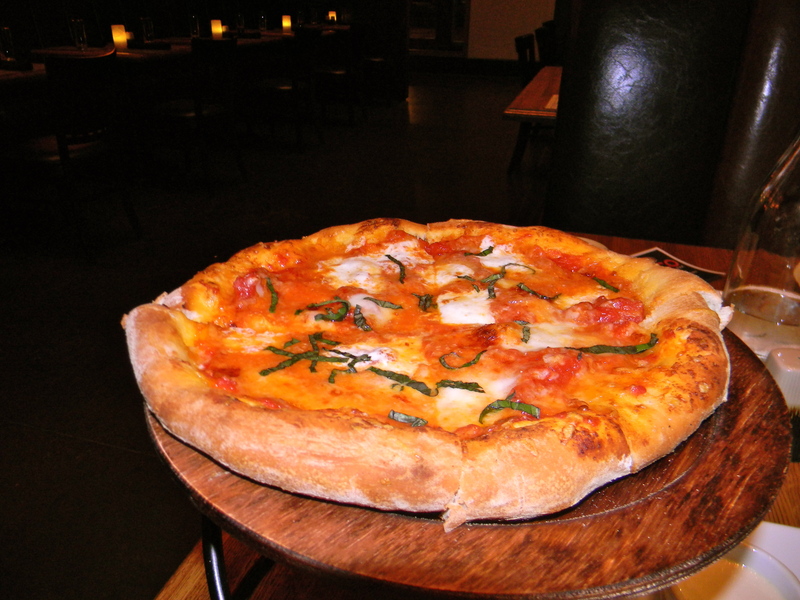 So we ordered the Magherita, a classic favorite with fresh ingredients. For our third course we ordered PEI Mussels, Grilled Lamb Chops, and Buttermilk Baked Chicken. As the entrees arrived, the aromas were so inviting. The mussels were pan roasted in spicy shellfish broth with Sardinian fregola, fresh herbs, and served with a char grilled bread to dredge up the rest. The chicken was sous-vided then baked with a black truffle pesto, accompanied with broccolini and whipped potatoes. The grilled soy-paprika lamb chops were my absolute favorite, the textures of eggplant puree, wilted spinach, and sauteed turnips served as mouthwatering adventure. 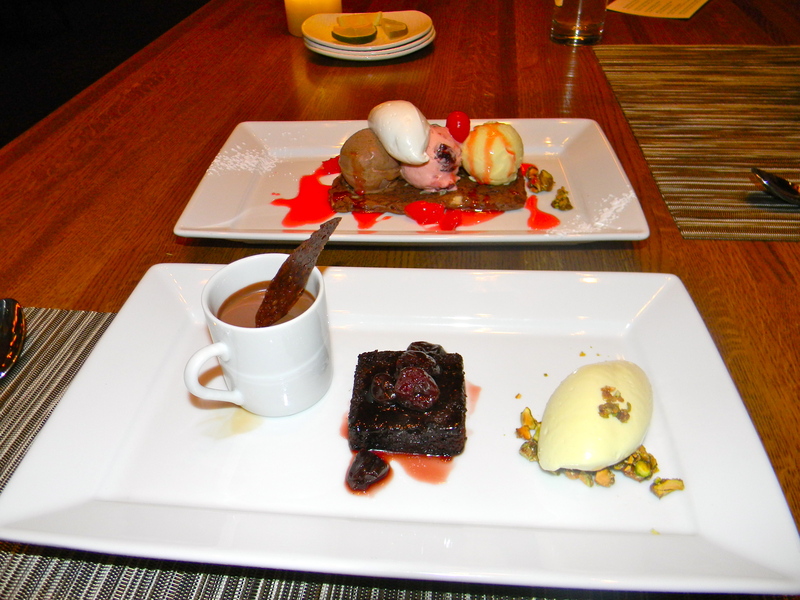 Lastly, after eating all of this delicious food I was determined to make room for dessert. We ordered the chocolate sour cream cake and sundae. I must say that I’ve been to several restaurants and pretty much always have an idea of what the dessert is going to look like but not this time. The plate presentation was both surprising and appealing. Pure genius! Come check out NICO Kitchen & Bar for both lunch and dinner. It is ideal for large functions, after-work cocktails, or an intimate date. Great food for fair prices. Lunch Hours: Mon.-Fri.: 11 a.m.-3 p.m.; Bar Menu available 3-5 p.m.
Dinner Hours: Mon.-Thurs. : 5-10 p.m.; Fri.-Sat. : 5-11 p.m. This entry was posted in Restaurant Reviews, Welcome and tagged Buttermilk Baked Chicken, Chef, Chocolate Sour Cream Cake, Chopped, Culinaire, Entertaining, Home, Isaiah Kelsey, Lamb Chops, Lamb Meatballs, Medal bar, Midtown Manhattan, New Jersey Performing Arts Center, Newark, Newark New Jersey, NICO Kitchen + Bar, PEI Mussels, Polenta Fries, Pomegranate Chili Wings, Restaurant, Ryan DePersio, Sous-vided, Sundae, urban.food.print, Urban_Foodie14. The lamb chops sound delish! I’m curious about the polenta fries, I’ve never had them. Next time I’m at NJPAC for show, I’ll stop by NICO Kitchen & Bar for a bite.